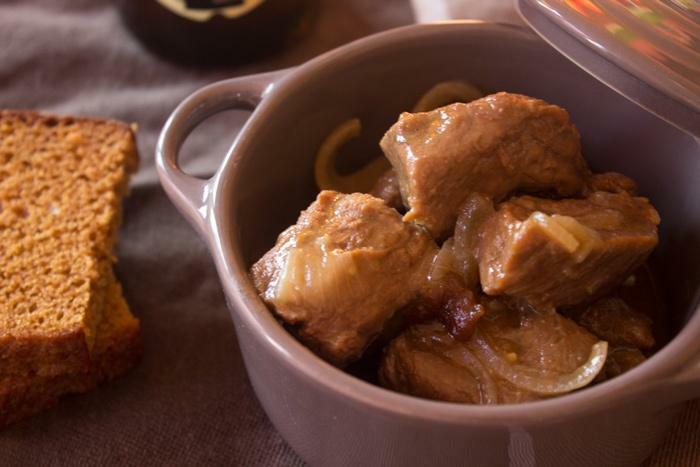 Carbonnade flamande is a traditional Belgian recipe also extensively served in the north of France. 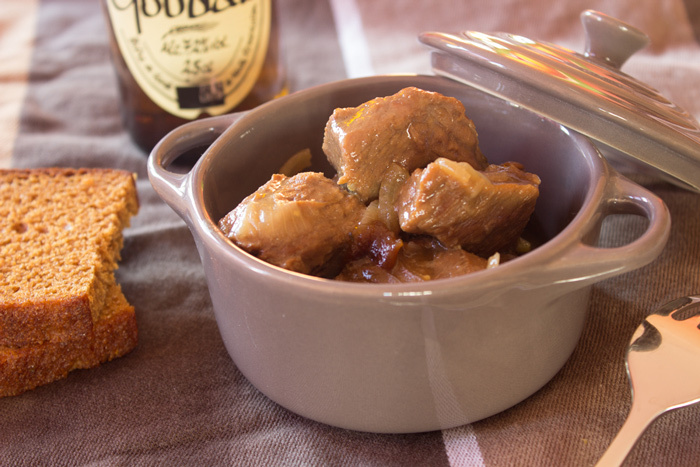 This is a delicious beef and onions stew made with beer. The secret ingredient is to crumble some gingerbread one hour before serving. Sure this recipe takes some time. You will need to leave it to cook for three hours. But this is so delicious that you will not mind. Like his cousin, beef bourguignon, meat becomes so tender that it will be melting in your mouth. Be carefull on the choice of your beer. A brune or red abbey beer will be more appropriate. I love beef stews… long time to cook but takes only few minutes to make. That’s the perfect recipes when I have guests. I try to always prepare everything one day before. That way I need only few minutes to heat up the meal again 🙂 and it tastes even better. Melt butter in a large casserole dish. Brown meat on each side and reserve. Fry onions, add meat. Spread flour and coat meat. Add red beer, bouquet garni, salt, pepper and pressed garlic. Cover (mandatory) and leave to cook for 2 hours on low heat. Crumble gingerbread. Add in casserole dish with Dijon mustard and brown sugar. Leave to cook for another hour. Serve with fresh pasta or French fries. Personally I like it more with fresh pasta; but this is your choice to make :-). Thank you very much for reading. Register to the newsletter or follow me on social media to receive the latest recipes of a French girl “cuisine”. If you like stews, you could be interested in visiting the recipe index. Delicieux! Nothing much better than a hearty beef stew this time of year! Thank you chef mimi! Yes that was delicious. Will not wait a long time to make another one. 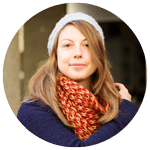 Wondering what kind of “garni” you are meaning?